Senate Concurrent Resolution No. 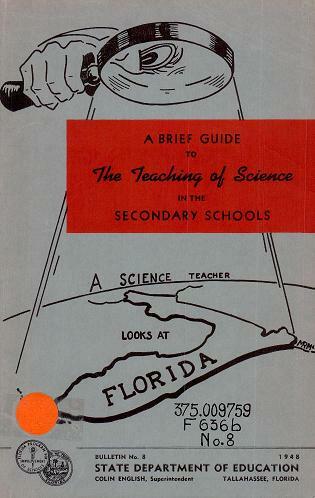 28, passed by the Florida legislature in 1927, directed the formation of a textbook review committee that would investigate claims of “vulgar” material found in college textbooks. But a citizen group had already been on the hunt since the previous year. L.A. Tatum, an elder in Tallahassee’s First Baptist Church, had created the Florida Purity League in 1926. 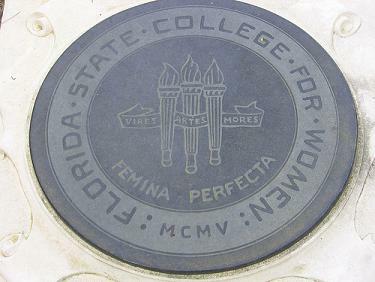 The Purity League’s main target was the Florida State College for Women (changed to Florida State University in 1947) and the supposedly heretical books found in its libraries and classrooms. Tatum’s complaints were heard by the Board of Control over and over again, but didn’t get much traction. The FSCW president, Edward Conradi, defended his school and professors before the Board, saying that no one taught anything contrary to the Bible and that the books currently in use in his school were widely used in colleges throughout the country. But then came the 1927 Senate Concurrent Resolution. Senator W.J. Singletary led the legislature’s investigative committee. He took the same road Tatum was on, challenging psychology and sociology texts, and accusing professors of teaching evolution as fact. The University of Florida was under the gun just like the FSCW. President Albert A. Murphree stood alongside Conradi in defense of their schools. However, Murphree tended to be more conciliatory than Conradi in the beginning. Murphree offered to move all questionable books to a secured area so that only students with special permission and their teachers could access them. Conradi resisted doing so, especially when it came to having to appease the odious Tatum. He eventually followed suit, though. We are not in sympathy with your propaganda against the Florida State College for Women, Dr. Edward Conradi and the faculty of the college. It is our opinion that your propaganda is distasteful to the vast majority. The red-hot antievolution effort of the 1920s cooled off significantly by the end of the decade. It became a minor issue during the 1928 gubernatorial campaign, with three out of the four candidates advocating antievolution. 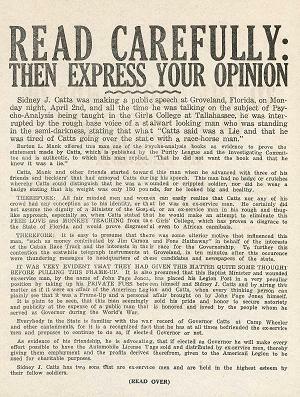 A December 1927 St. Petersburg Times article listed among Sidney Catts’ platform issues “Let’s have no evolution of man in our schools.” A broadside distributed on behalf of Catt’s campaign even said (emphasis in original) “… Catts stated that he would make an attempt to eliminate this FREE LOVE and MONKEY TEACHING from the Girls’ College, which has proven a disgrace to the State of Florida and would prove disgraceful even to African cannibals.” One rival candidate was John Taylor, the senator who had tried to have the 1927 antievolution bill snuck out of committee and onto the senate floor for approval. But as a sign of the changing times, the only candidate not on the antievolution bandwagon, Doyle Carlton, won the governor’s office. But the amendment drew a hostile response. Senator Pat Whitaker expressed what most other lawmakers where thinking: “This legislature was pestered during its last session by ‘monkey business’ which emanated from Hillsborough county. I think it’s time that we pass a uniform text book law without confusing it with the evolution issue.” The amendment was shot down and the antievolution movement overall pretty much died with it. An antievolution bill was introduced in the 1933 legislative session, but didn’t make it out of a judiciary committee and attracted no significant interest in the media. Many teachers asked the workshop group which prepared this bulletin to include suggestions, if any could be found, for helping the teacher advise with students and parents about the supposed conflict between the teachings of science and the teachings of the Bible. Many teachers have been misunderstood in their communities because of the inability to solve this problem. It is a real problem for many students and parents. The requests for help were urgent. There might not have been any headline-making antievolution activities going on for several years, but it’s obvious that individual teachers were still dealing with the problem in their classrooms then just as many are now. Then in 1971 antievolution, like a slumbering Godzilla, was prodded awake to tear through the Florida education landscape. Yet again legislation was proposed, but this time the newfangled concept of “creation science” was unleashed on lawmakers. At the same time, creationists attacked at the local level, finding varying levels of success at getting county school boards to consider balancing evolution instruction with creationism. In the next installment of this series we’ll take a look at the first of many counties to face this dilemma and become swamped in the controversy: Pinellas. I thought today’s media was bad. In 2008, this kind of sentiment was rekindled a bit by Sarah Palin. She railed against research she obviously didn’t understand – the implications of which could have indirectly helped her own child. Ignorance is no excuse for policy blunders. Today’s politicians should take heed and cover their butts with real scientific counsel – something our current “leaders” have not done. I hope Obama will help to usher in a revitalized scientific reliance by the government.